Specially formulated for dry skin, these make-up remover wipes cleanse gently, remove even waterproof mascara and soothe the skin, leaving it feeling wonderfully soft. Directions: Gently wipe cloth over your eyelids, face and neck. There is no need to rinse. Reseal package with the adhesive label to keep the towelettes moist. 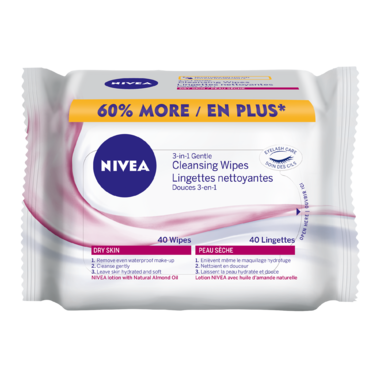 For best results, use these facial cleansing wipes as part of your skincare routine with NIVEA Essentials. Good value for money. These clean well and don't leave traces of makeup as some cloths do. I will definitely use these again.